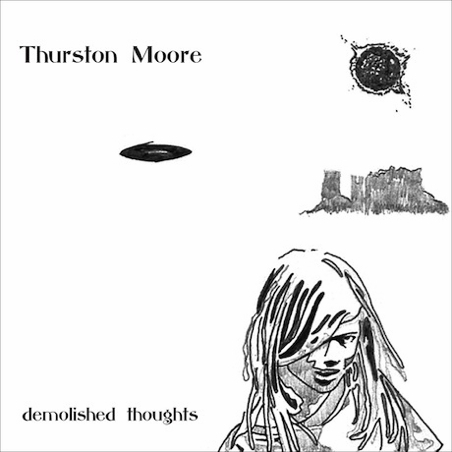 Beck produced Thurston Moore's 2011 solo album, Demolished Thoughts. The record was recorded in Beck's home studio, which is called The Library. .
On day four I played the fourth song "Blood Never Lies", while hitchhiking to Venice Beach on the PCH. I set out 30 minutes early to get a head start before Beck came whizzing by in a rented British six-cylinder Triumph TR6, one hand on the wheel, the other whipping a whip-mic over his head and every time it came close to my mouth I would sing the lyrics that came to me as my thumb beckoned psychedelic housewives to consider taking me into town. Beck, as the producer, keeps "Blood Never Lies" fairly simple, though it certainly sounds complicated. That's quite skillful! The song consists mainly of Thurston on guitar and vocals, and a harpist and violinist adding emotion and atmosphere.